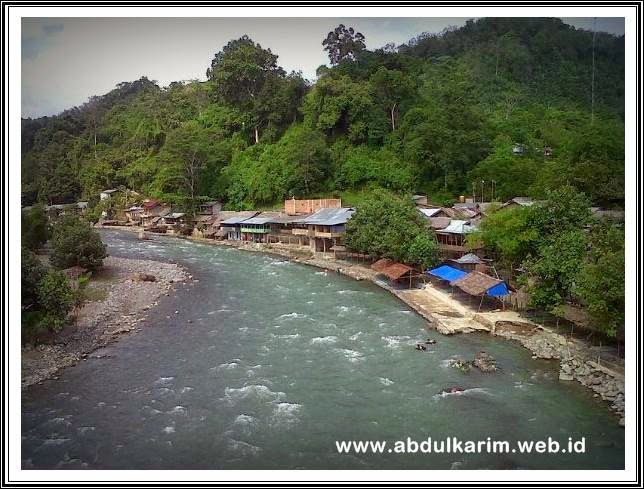 Bukit Lawang Tour - Bukit Lawang is a village in the district Bahorok, Langkat, North Sumatra. Its territory included in the scope of the Gunung Leuser National Park covering an area of 1,094,692 hectares. Located 82 km from the city of Medan and become one of the important attractions in North Sumatra. More than 8,000 foreign tourists (Abroad) came to the village every year to see firsthand the existing nature conservation here. In language Bukit Lawang means "Hill Gate", where there is a gate of Gunung Leuser National Park here. Bukit Lawang is located at an altitude of more than 500 meters above sea level and presenting outstanding natural scenery here. Many animals that are protected in the Gunung Leuser ecosystem is, among others, an orangutan, Sumatran tiger, Sumatran elephants, rhinos and tigers still exist in this tropical rain forest. 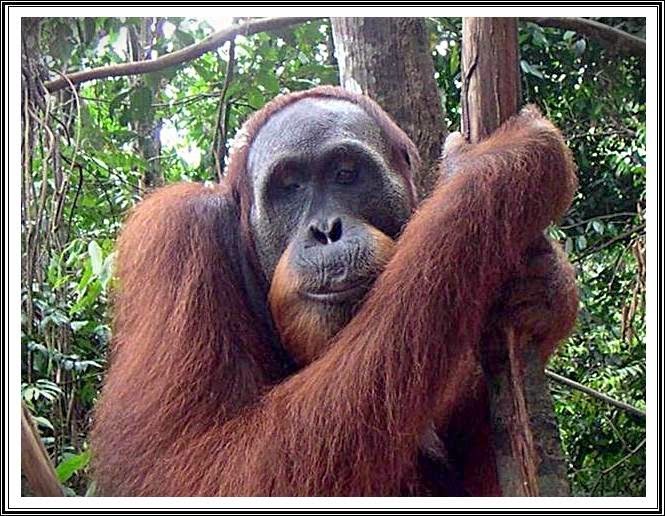 And the most attention is the Sumatran Orangutan (Pongo Abeli) which often roam here. The number of these animals only live again in the World 7000. Then built center Orang Utan rehabilitation and conservation of the Mount contained this mace. Activities that we can do in Bukit Lawang Tour . Exploring the tropical rain forests TGL gives a tremendous impression, we can around the forest and see the variety of plants grown in PPLH (Environmental Research Center) Bahorok here, if lucky we will find the woods on the way. You do not need to worry to start trekking, when the first one came here to be a lot of locals who volunteered to be your tour guide. Bahorok river located in Bukit Lawang really beautiful if supported by sunny weather. Bluish green color looks clear and full of charm. There are many places of rest that we can use here, retirement cottages available for rent with prices varying. Rafting activities (rafting) an activity that is not forgotten in Bukit Lawang, in addition to the swift current of the river is also noticeably more challenging with views of stunning tropical rain forest. During the wet season, it's time to challenge the adrenaline of Bukit Lawang up to the city of Bahorok. Besides Rafting, Kayak also become unforgettable events. There are several rental services and organizing for water sports professionals in Bukit Lawang. If rafting and kayaking seem more premium, you can try the same sensation with exercise tubing or rafting sometimes called traditional that became one of the favorite activities here. Single Person or mutiple also gives the impression that cool to feel the rush of the river in the Gunung Leuser National Park. You happy through the cave? caving activities in Bukit Lawang maybe a little cheer you in the Batcave. Less than half an hour from the tourist center we can visit this cave. Besides the cave there is also the Swallow Cave and Cave Ship. If along with guide, there are two opportunities you encounter an orangutan, first when trekking in the forest and the second when the climbing of Mount Leuser National Park Gate to the feeding area. It can not we get in Another State. The number of Sumatran orangutans live 7000 throughout the world, becoming a serious note for the conservation. This animal is so unique. Orangutans have properties similar to humans up to 94 anatomical and psychological nature. Orangutans also menstruate, containing the normal 9 months also sensitive to human psychological behavior. Large enough strength to make it permanent nan dangerous wild animals. Without accompanied by your guide is strictly forbidden to disturb or feed the orang-utan. Conservation of posts we will run approximately 10 minutes at a feeding. If you want to follow the feeding activity, then you can only do it twice, first at 08.00 morning, the second at 03.00 afternoon, crossing through the raft (dinghy) provided the officer. Camping in Bukit Lawang? why not. Here is also available camping ground for school children or the public. The location is cool and sometimes not escape from our sight monkeys gone wild TNGL mace along the Camping Ground. This is actually outside the context of Bukit Lawang, this activity is carried out in Tangkahan. however there are several tour and travel providers prepare a package of 3 or 6 days of trekking from Bukit Lawang towards Tangkahan. We can bathe the elephants, ride it and also see this rare animal life closer. If we use off-road vehicles. we only need less than 2 hours by road conditions are less friendly. This is the most challenging activity and harm in that can be done here, there are several tour guides who provide travel package 7, 8 or 11 days of Bukit Lawang to the Kuta Cane Land Alas, Southeast Aceh. We explore the real tropical rain forest. It takes guts and the ability of the surviving experienced here. We will explore the Gunung Leuser National Park which saves a lot of protected species. There are about 380 species of birds, 205 species of mammals including orangutans (Pongo Abelii), Sumatran tiger (Panthera tigris sumatrae), the Sumatran rhino (Dicerohinus Sumatra). Sumatran elephant (Elephas Maximus Sumatranesis) and 4000 species of plants including Rafflesia flower. That the activities that we can do. Bukit Lawang is also part of the world heritage sites that are members of the Gunung Leuser National Park. let's come and experience an unforgettable tour in Bukit Lawang start rafting to Meet the orangutans in Sumatra. anda suntuk di rumah tidak tau mau ngapain !!! Buat yang suka main Bola, Baccarat, Roulette, Sicbo, Togel Online, Sabung Ayam. Minimal Deposit dan Withdraw 50 ribu. Proses deposit dan withdraw super cepat. Untuk Info Lebih Lanjut Melakukan Register Dengan Super Cepat Dan Tentunya Memuaskan bisa lihat dibawah ini. (Terima Kasih). www.s1288.poker merupakan situs judi kartu online TERBAIK dan TERPERCAYA Se-INDONESIA. S1288Poker hadir karena mendengar para keluhan dari para para pecinta judi kartu online yang kurang puas dengan pelayanan dan merasa dibohongi dari situs judi lainnya. Di S1288Poker dipastikan tidak ada campur tangan BOT dalam permainan. DIJAMIN 200% play FAIR (player vs player). Copyright © 2014 Medan Story.